Ephesus, with a population of 250,000, was the chief commercial city of the province and the center of the mother goddess worship of western Asia. In the New Testament era it was the fourth greatest city in the world, after Rome, Alexandria in Egypt and Antioch of Syria. “Ephesus was the Gateway of Asia. One of its distinctions, laid down by statute, was that when the Roman proconsul came to take up office as governor of Asia, he must disembark at Ephesus and enter his province there. For all the travelers and the trade, from the Cayster and the Meander Valleys, from Galatia, from the Euphrates and from Mesopotamia, Ephesus was the highway to Rome. In later times, when the Christians were brought from Asia to be flung to the lions in the arena in Rome, Ignatius called Ephesus the Highway of the Martyrs.” (William Barclay, The Revelation Of John, Vol. 1, p. 58). Acts 18:19 He came to Ephesus, and he left them there; but he himself entered into the synagogue, and reasoned with the Jews. Acts 18:21 but taking his leave of them, and saying, "I must by all means keep this coming feast in Jerusalem, but I will return again to you if God wills," he set sail from Ephesus. Acts 18:24 Now a certain Jew named Apollos, an Alexandrian by race, an eloquent man, came to Ephesus. He was mighty in the Scriptures. Acts 19:17 This became known to all, both Jews and Greeks, who lived at Ephesus. Fear fell on them all, and the name of the Lord Jesus was magnified. Acts 19:26 You see and hear, that not at Ephesus alone, but almost throughout all Asia, this Paul has persuaded and turned away many people, saying that they are no gods, that are made with hands. Acts 19:27 Not only is there danger that this our trade come into disrepute, but also that the temple of the great goddess Artemis will be counted as nothing, and her majesty destroyed, whom all Asia and the world worships." Acts 19:35 When the town clerk had quieted the multitude, he said, "You men of Ephesus, what man is there who doesn't know that the city of the Ephesians is temple keeper of the great goddess Artemis, and of the image which fell down from Zeus? Acts 20:16 For Paul had determined to sail past Ephesus, that he might not have to spend time in Asia; for he was hastening, if it were possible for him, to be in Jerusalem on the day of Pentecost. 1 Corinthians 15:32 If I fought with animals at Ephesus for human purposes, what does it profit me? If the dead are not raised, then "let us eat and drink, for tomorrow we die." 2 Timothy 1:18 (the Lord grant to him to find the Lord's mercy in that day); and in how many things he served at Ephesus, you know very well. 2 Timothy 4:12 But I sent Tychicus to Ephesus. The apostle Paul first visited Ephesus on the return from his missionary journey where he “entered the synagogue and reasoned with the Jews” (Acts 18:19–21). On his second journey, Paul came to Ephesus and taught the twelve disciples who knew only the baptism of John (Acts 19:1–7) and “went into the synagogue and spoke boldly for three months, reasoning and persuading concerning the things of the kingdom of God” (Acts 19:8). He later taught in the school of Tryannus for two years, and as a result, “all who dwelt in Asia heard the word of the Lord Jesus, both Jews and Greeks” (Acts 19:9–10). Ephesus was full of wizards, sorcerers, witches, astrologers, diviners of the entrails of animals and people who could read one’s fortune by the palm of the hand. And yet, after the preaching of Paul, the magicians publicly burned their books, “so the word of the Lord grew mightily and prevailed” (Acts 19:19–20). Timothy and Erastus were with Paul, but he sent them to Macedonia, while “he himself stayed in Asia for a time” (Acts 19:22). At the end of his third missionary tour, in the spring of a.d. 57, Paul stopped briefly at Miletus, “for Paul had decided to sail past Ephesus, so that he would not have to spend time in Asia; for he was hurrying to be at Jerusalem, if possible, on the Day of Pentecost” (Acts 20:16). Paul met with the elders of Ephesus at Miletus (Acts 20:17–38). In his final words to these elders he told them of his deep sorrow that they would see his face no more (Acts 20:38). Ephesus once had a great harbor, but because of the lack of tides in the Mediterranean to clear out the debris, the harbor tended to silt up. It was probably from this harbor that Paul set sail for Macedonia after the Ephesian riot (Acts 20:1). The main street of the city was the Arcadian Way which led from the harbor to the theater. The street was over 100 feet wide and paved with marble slabs. The street was often used for parades and ceremonies, and was flanked on either side by rows of columns 50 feet deep. The street was named in honor of the emperor Arcadius (a.d. 383–408) who enlarged and restored it. At night the street was lit by lanterns. The great theater at Ephesus gives us some idea of the elegance of the ancient city in the time of Paul. The construction began during the reign of Claudies (a.d. 41–54) and was completed during the reign of Trajan (a.d. 98–117). This massive structure measured 495 feet in diameter and seated an estimated 25,000 people. The great uproar over Diana of the Ephesians took place here (Acts 19). The Library of Celsus built in a.d. 135 by Julius Aguila in memory of his father, Celsus, who was a Roman senator and governor-general of the province of Asia. Here thousands of parchments and papyri were stored, protected from dampness and worms by a double wall. Estimates of the number of rolls that could be stored in the library vary from 9,500 to 12,000. Celsus was a lover of books and was given the honor of being buried, not only within the city, but in the vault of his own library among his books. On the first floor of its façade there stood four female statues representing wisdom, fortune, knowledge, and virtue. Another important street was Curetes Street, which derived its name from the Curetes (priests), who guarded the sacred fire of the hestia (hearth) in the prytaneion. The Curetes were a college of priests attached to the service of Artemis. Many inscriptions and reliefs may be seen along the street, including a relief representing Nike, the goddess of victory, with a wreath in her left hand and a spike in the right. The most beautiful building on Curetes Street is the Temple of Hadrian (a.d. 117–138). The Fountain of Trajan (a.d. 98–117) is located on the northern end of the street—it was dedicated to the Emperor Trajan at the end of the first century. The Odeion in Ephesus had 22 tiers and accommodated over 1500 spectators. Here musicians played their flutes, lyres, and citharas, and poets recited from Homer. 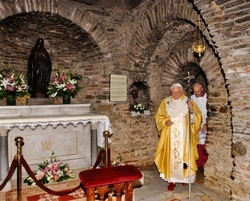 Although Luke does not mention Paul being imprisoned while in Ephesus, Paul himself told the church at Corinth, “For we do not want you to be ignorant, brethren, of our trouble which came to us in Asia: that we were burdened beyond measure, above strength, so that we despaired even of life. Yes, we had the sentence of death in ourselves…” (2 Cor. 1:8–9). On another occasion he spoke of his fight “with beasts at Ephesus” (1 Cor. 15:32). Near the end of the first century our Lord said of the Christians in Ephesus, “I know your works, your labor, your patience, and that you cannot bear those who are evil. And you have tested those who say they are apostles and are not, and have found them liars” (Rev. 2:2). “A city of such prominence as Ephesus, located on a world thoroughfare, was bound to get its share of false teachers, even men claiming to be apostles. In an age when we pride ourselves in tolerance and compromise, this attitude might appear bigoted and intolerant. Bigoted, no; intolerant, yes, but an intolerance commended by the Lord. Churches would do well today to follow such a course with their intellectually oriented teachers and leaders who pervert truth and make boastful claims for their own human wisdom. John approved the practice of proving all spirits (I John 4:1).” (Hailey, Revelation, An Introduction And Commentary, p. 121).